Since the San Cristobal cigar brand's introduction in 2007, one great cigar line after another has emerged thanks to the remarkable talents of world-class blender Jose "Pepin" Garcia. 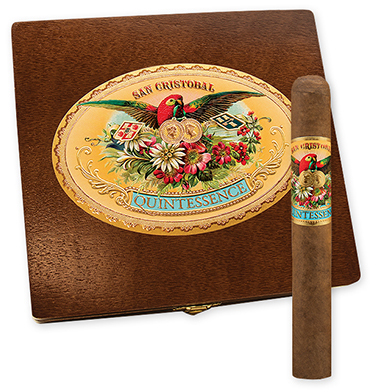 Introduced in 2016, the San Cristobal Quintessence is another piece of art drawn from a luscious Ecuador Habano wrapper and the finest, premium aged binder and filler tobaccos grown on the Garcia family estates. Handmade at My Father Cigars' factory in Esteli, Nicaragua, the medium-bodied Quintessence is beautifully constructed and shares delectable notes of molasses and coffee with hints of dried fruit, figs, and sugarcane. A tasty indulgence.